Video footage has emerged showing the moment a gun-toting man was caught on CCTV aiming his gun at a police vehicle. 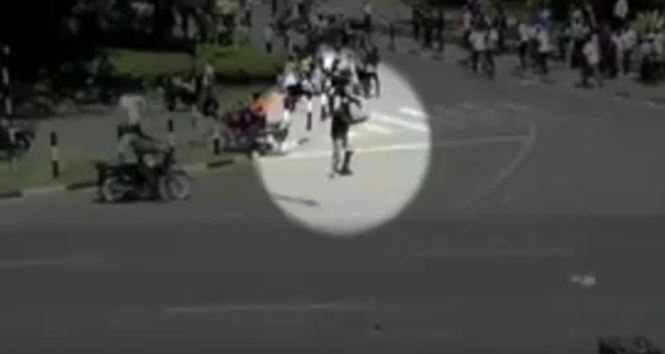 The clip has been shared on Twitter by Kenya Police who claim the man had the intent to fire. The incident happened on Tuesday before the start of Raila Odinga’s swearing-in ceremony at Uhuru Park. The one-minute-46-seconds clip shows a man dressed in a black leather jacket emerge from a crowd of running Nasa supporters before pulling out what looks like a pistol. He is then seen aiming the firearm at a speeding police vehicle as he runs towards it. In another camera angle, the man is seen moving his arms as if to instruct nearby Nasa supporters to move in a certain direction. Police said yesterday that a manhunt has been launched for the man and that they are offering a cash reward to any person with information that could lead to his arrest. “We have launched a manhunt for a man captured on CCTV cameras aiming a firearm at a Police vehicle with intent to fire on Tuesday before the NASA event began at Uhuru Park. A cash reward will be offered to any person with information that could lead to his arrest,” a post on their official Twitter account, @PoliceKE, reads. The clip comes a day after Interior Cabinet Secretary Fred Matiang’i said the government had received information that the crowd which attended the event had been infiltrated by criminal elements. “Many Kenyans might not be aware of this but we can tell you there was going to be a bloodbath, a massacre or catastrophe was going to happen there,” Matiang’i said. The no-nonsense CS claimed the coalition wanted the said massacre to be captured live on TV with the intention of blaming it on the police. He vowed that all will be done to bring the criminal elements to book.